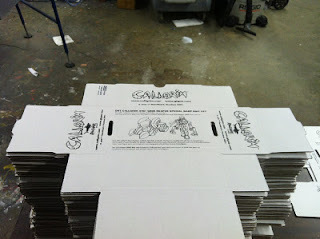 Want to see some really cool artwork be silkscreened on boxes? This post shows the development of the WARP Bike boxes, and they're utterly delightful. Take a look! The Onell Design Blog has a post called Runners and Hoppers, which, uh, introduces you to new vehicles called Runners and Hoppers. While similar to the WARP Bikes from Callgrim at first glance, these appear to be very different vehicles-- so do check them out! No word on a specific date or price just yet, but they sure as heck do look neat! 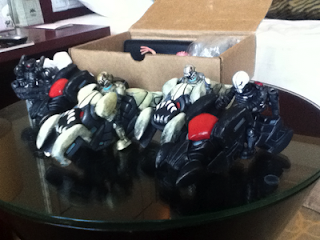 An early release of the Glyaxia Command Elite Glyan Action Figure (and most of the October 2011 drop) was sold at New York Comic Con 2011, and that's where I got mine. The yellow and blue design used on Pheyden and other figures was really striking but I missed out on those, so getting this Glyan-- complete with that swell, Atari-esque shoulder tampo-- was an irresistible purchase. I got his "reverse" figure too, because, well, I'm not made of stone. Did you already order your WARP Bikes at the Callgrim Shop? If not, they're up! $50 per set, go go go! Be sure to check out concept art, in-progress assembly and prototyping (and creators), and a breakdown of parts of the new WARP Bike coming shortly from RawShark Studios. It is awesome. Made of 3 pieces of plastic and 19,931 paint applications, this vehicle is an impressive beast. Because one just isn't enough, the Callgrim blog shows DRT Warp Bikes, each with unique deco and a (seemingly) exclusive pilot. Riac and his ride the Growler (pictured) as well as Callgrim and the 'Grim Reaper are $50 per set, and will drop November 21 at 9:00 PM. 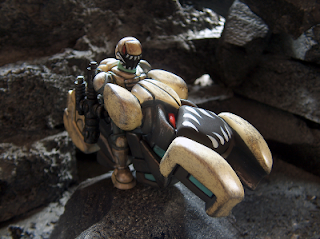 Coming this month is the Warp Bike from RawShark Studios, which may be the first proper non-figural vehicle made by the Glyos camp. It looks really cool-- check out this posting for a few more details, but there aren't many there other than it's coming this month and it's a full production piece. If you follow Glyos you may be familiar with figures called "Echo Morphs," which are a pretty amazing gift set-- these are being phased out for smaller part packs like the Task Force Volkirun Extra Set. 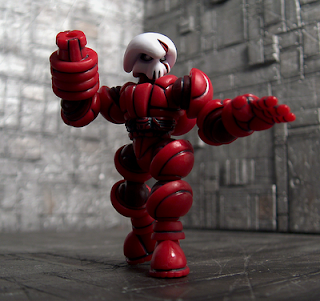 An Echo Morph comes with one set of arms and legs, two whole torsos, and four total heads. The "Extra Set" nabs you 3 more heads and a torso, which is good and bad-- you'll need to have arms and legs on hand to make use of the torso, and the heads are appropriately... heady. It seems like we just had one, but it's time for another awesome new drop from Onell Design! The Big Rig shown in New York last week is on deck, as are new Glyans, Phaseons, and more, plus they all go up Sunday at 9 PM Eastern. Here's the menu, which is on their post, but here so I can find it easily later. I took a ton of shots at New York Comic Con last weekend, which was quite the experience. The Onell Design booth was a living, thriving organism which changed its guests every few hours-- check out some of what I saw from Onell, THEGODBEAST, and others you'll be reading about here very soon! You can read all about it and sign up here, and early interest is incredibly strong! Production in China is still up in the air and a ways off, so this could be the only shot at this figure. And it might not be. Either way, don't say we didn't warn you that you can get this one right now! Onell Design gave us a heck of a scoop! Get a first-look at this possible upcoming Glyos/TheGodBeast/Matt Doughty/Jason Frailey figure concept, which may remind you of some battling figures from the 1980s. It has excellent articulation and... well, just go look at the pictures. The Onell Design crew are in Japan and apparently, they've been pretty busy. 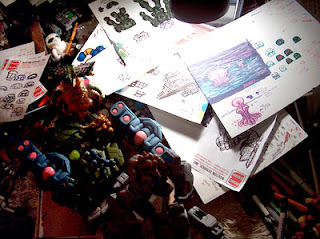 From the blog: "The most shocking element of the night though, was when [Yasuhiro Nightow] whipped out an original sketch done by [Noriyuki Jinguji] that nearly made me and Jesse's heads explode. According to Nightow, Jinguji had become interested in the Rig that I had given him last September, and after analyzing it for a while, decided that Callgrim should have a Rig type vehicle as well. So he designed one." Wow! The designer worked on Trigun, Gungrave, and other properties so that's actually super-cool on a variety of levels. Be sure to read their post! Our pals from 1Shot Toys have turned us on to Glyoween, a new set of low-run figures he's doing for Halloween! 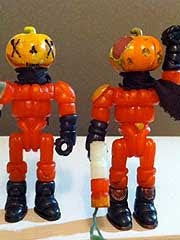 Each figure has a unique pumpkin head plus a specially decorated red Glyan body. Each figure is $20 plus $5 shipping, and more details will follow. I assume they will be sold here when the time comes, but stay tuned! A massive post at THEGODBEAST Customs showcases pretty much every packaged Finkerbot and Bio Jumper there is! The former has a charming robotic illustration, while the latter is vibrant, colorful, and equally awesome for different reasons. As always, this is worth checking out! More updates are likely on deck, so keep a-checkin'. 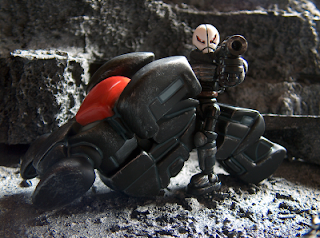 THEGODBEAST Customs have revealed Kabuto Mushi DX, a larger beetle figure seemingly more in scale with Rigs and Armodocs. No word yet on when, if, or how it will be released but it certainly looks spectacular! ...and huge. Like, really bug. Er, big. The Onell Design crew has made a trip to China, and they're posting pictures of food, new toys, and other fun stuff. Even fish. It's well worth checking out, particularly exciting are what I assume to be blue and yellow Glyans! Check it all out! 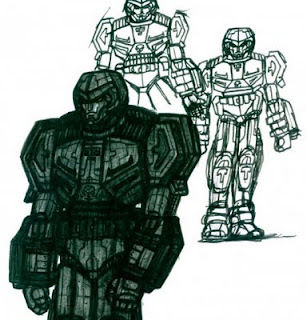 The always-fun Battlegrip.com posted some of the early Onell Design concepts for Pheyden this week, which predate the release of the actual toy. Otherwise, it wouldn't be concept art. Other figures, including a large alien figure (which remind me of this guy) and other funky little dudes were shown, but here's something I found extremely interesting. And for all I know, this is what was being discussed a few weeks ago. 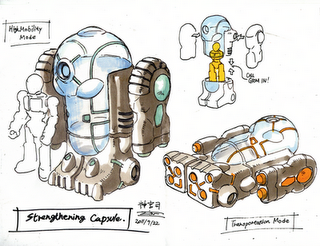 While labeled "Old Concepts," it ties in to some recent comments from the Onell camp indicating a new product would be of great interest to fans of the 1980s Transformers line... and dang if those guys don't look at least a little like Floro Dery's old boxy robot designs. I would assume these are just fun old designs they're showing off for some reason but, well, I know I love to drop hints. It wouldn't stun me if these may be a sign of things to come. In case you missed it, the clear red Callgrim Altervoth Mimic has returned to the Callgrim Shop for $10. If you haven't yet scored one, Callgrim is a character design which sometimes appears in the Onell shop, but several flavors of this nifty figure have been made and this is another great entry in the series. Also, the Standard Grim Squad Armodoc-- a great figure, I've got one here-- has since sold out. This makes the Grim Squad Reverse Armodoc, which is still available, the only Armodoc being sold in the USA right now as far as I can tell. It's $25, same as a Rig, and it's a nice piece. Assuming you made it in time, the deliveries of the August 2011 drop of Onell Design toys are starting to show up as of today. Email confirmations with tracking numbers were sent out, and as always bonus items were included. A lot of people received a Gold Govorum head, and random Bean Bots. (The Bean Bot is an earlier version of what is currently being sold as the Phaseon, with different fists and a few other alternate parts.) 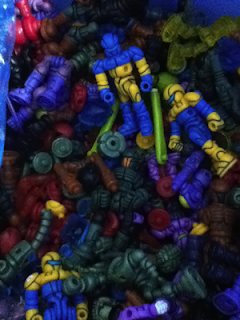 I got a bagged blue Bean Bot, but I saw carded ones, pink ones, and others show up. If you missed the drop, there's not much left. Axis joints are still available, but 6 of the 7 Glyans are low stock or sold out, Xodiac and the Rig sold out immediately, and the gold Argen MK IV is almost gone. So I wouldn't dawdle, "low stock" seems to mean "you got about a week or two." Did you get anything surprisingly good, or enough parts to make an awesome new build? Let us know! Since there are no Glyos playsets, I bought a Fisher-Price Imaginext Space Station Toy Set on sale a few weeks ago to see if it indeed would do the trick. While not perfect, it's a close fit and certainly shows how the line may be close enough to work with your Onell Design action figures. Anyway, read all about it on 16bit.com's Figure of the Day! 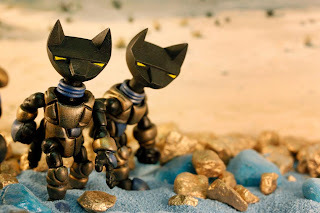 I assume you've seen the posts here, but Onell Design chimed in with more on the Bio Jumper figures, showing original concept drawings and a story behind their names. They "jump" (hijack) the biology of other characters. Neat! Also creepy. In light of the various teaser shots, a lot of discussion has popped up about what people are seeing, or what they think they're seeing. A Volkirun Wing Rig test shot appeared in there and a clear shot showed up in the October Toys forums. Like a lot of sample items, it was made in whatever color the factory happened to be using at the time, and while the first mass-release Rig was the Relgost version it's neat to see this developmental concept. Note, the Volkirun Rig wings appear to be unpainted. The Gus Fink/THEGODBEAST Customs collaboration Finkerbot continues to march along, as you can see there are a few of them and they come in different colors. You can click through to see them posed with (and ripping apart) hapless Gobons and Phaseons. I must say, they're turning out quite nicely! "Speaking of the Rig, something kind of insane is in development for what we hope is an October release. If you like vintage Transformers then you might like what we have on deck. " 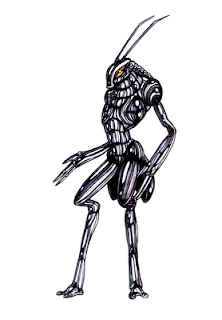 Update: Also, another late-night post has a ton of concept art, including what seem to be a new figure type and some interesting (possibly water-based) alien creatures. If you're the kind of person I am, be sure to open Photoshop and whip out that "Dodge" tool. Update #2: This turned out to be the first reveal of the Armorvor! For those keeping track, the little guy was first "shown" here, first revealed in three dimensions at New York Comic Con 2011, and was first sold in July 2012. Assuming the terrible weather doesn't cause surprise damage to the East Coast tonight, you're just about due for the Onell Design Store August Drop with 7 Glyans, a new Argen Buildman in gold, and tons of other bits and pieces including the winged Rig and the first-ever Onell Exclusive Outer Space Men release. We've been given an advance look at Xodiac, so check out that review here while you hit "refresh" on the store. If you want my unsolicited advice, consider picking up a 2-pack of Crayboth figures while you order if you haven't already. While not as articulated or as versatile, they're darned neat. Four Horsemen Redesign of Pheyden A-Coming? "Eric Treadaway [of the Four Horsemen] actually gave me something at SDCC that follows in your line of thinking. I was shocked when he surprised me with a completely original take on Pheyden's noggin in fully sculpted form! We are cooking something up which will allow everyone to have a shot at this secret (not so much now) project. Pics are in the works!" Well! Now that I'm all excited about seeing... not that the drop and everything else wasn't cool, but as we like to say: more is better! Click here for the thread that lead to the comment. In a post called The Basics, Onell Design show off a trio of new Glyan figures with their helmets. Check out black, clear, and glow-in-the-dark Glyans. Also, the pricing for the Xodiac special edition figure has also been confirmed at $12.00. You can see this on an updated post from earlier this week. Again, all these figures-- and many more-- will be on sale Friday evening. Your friend and mine Seth has alerted me to something hidden in the October Toys forums-- a preview of the Gold Phaseon Gendrone Revolutionary! Onell sometimes sneaks out previews of upcoming launches in orders, and that's just one of them. 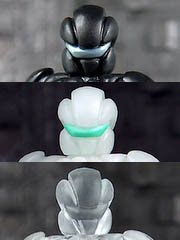 Also see a glow-in-the-dark Spectre Division Glyan, more Glyans with unified coloring (swapping parts form the normal releases), and more new Axis joints. What fun! In the Onell Design blog post "Mission Details", Matt Doughty has outlined all the new goodies up for grabs Friday at 9:00 PM Eastern. Of note are Glyans (one of which is pictured, dismantled, to the left) in seven different colors, new gold Argen MK IV and Phaseon Gendrone Revolutionary, new Axis Joint sets, Gobon blasters, the works. 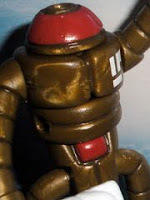 Also really thrilling is an Onell Design Outer Space Men figure: the Xodiac Glyaxia Command Special Edition. I'll be getting reviews up of some samples as soon as I can, so stay tuned-- it's going to be a fantastic drop! The grand total is about $119 $131 for one of every item, not including shipping or the undetermined price of Xodiac. "Do you have the POWER? 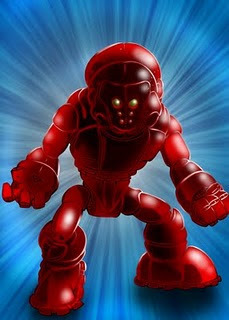 You could with this Glyos Head! It's base color is neon Orange, when it gets warm it changes to neon yellow. These are very limited to 4. 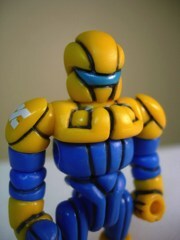 So add the strongest man to your Glyos collection!" If you've never heard of 1SHOT Toys, prepare to be dazzled! 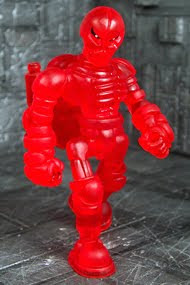 These guys designed a He-Man head mold with full Glyos compatibility, and a special run of these are going on sale at 8:30 Eastern Time Monday August 22. Pricing and quantity are unknown, but he mentioned it will have "limited color change orange to yellow" on the October Toys Forums. Might more Masters of the Universe follow? Signs point to "probably!" Numerous parties collaborated on a new project called Bad Luck Squadron, which seems appropriate given the amount of black cats involved. Figures are made up of new and existing parts. Pricing and a specific release date was not yet available, but as you can see there are multiple styles and according to the buzz on Twitter these seem to probably all be spoken for before the production phase is finished! Find more images and discussion here. Nathan Newell of Dork Dimension fame has contributed some particularly slick packaging art for the upcoming Bio Jumpers toys from TheGodbeast. This posting showcases 4 character portraits plus the header card. 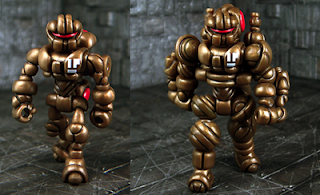 The basic gimmick is that these are a different kind of "Glyos compatible." Rather than plug into the head socket, they fit over a figure's head. Multiple styles are available and are quite nifty. Something new! 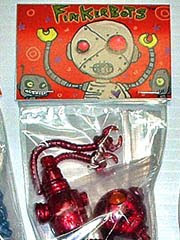 TheGodBeast writes: "Another TGB CUSTOMS official collaboration w/ Gus Fink & Onell Design...introducing "FINKERBOTZ!" Concept by Gus Fink, sculpt/molding/production by TGB, & joints/compatibility by Onell Design." It's a nice piece! The New York Comic Con edition is $50 and limited to 5 slots on the preview list. 5. The edition size looks to be 10-12, and you can sign up for one on the October Toys forums, or take your chances in the cold, harsh world. Another small production line is about to hit the web with Bah'glenn Creations' new Canne'boids figures, which will go on sale later this week. No prices were given, but the small hairy run of the little guys is capped at 18. That is not a typo. These hand-painted, faux-furry creatures have hand-painted and hand-cast heads and hands, and from the other images which have been shared they seem to use the Onell Design Buildman body. Sharp! That didn't take too long! As described last night, Battlegrip.com has the scoop on the new Rig. It's a remolded item with new wings which double as guns, and Phil from the site is the inspiration for the piece. He writes: "The origins of this new part stretch way back to June of 2010 when I visited Matt and had a chance to handle the original Rig master.[...] During that evening with Matt we chatted about how just swapping out the arms for wings would drastically change the look of the toy. Little did I realize at the time that Matt would latch onto that small snippet of our evening and create something truly amazing." It's worth noting that this piece looks cool, is due later in August, and sports a tampo similar to a symbol on the new Glyans and Glyaxian Xodiac. 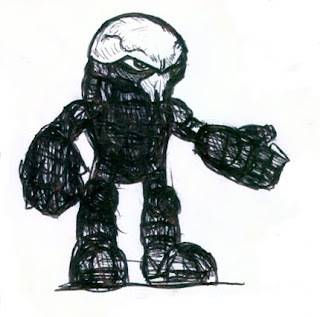 UPDATE: Now there's a post at the Glyos Transmission Web Log with more intel. Do read it! While preview Glyans were sold recently, Matt Doughty from Onell Design posted a sneak peek at eight flavors of the figure which presumably will be sold in the very near future. I've got a sample of the desert one (fourth from the left) and they're really neat figures with more human, or at least human toy, proportions. Not counting the spare head or weapons, each figure is made from about 13 parts-- 12 visible body parts and a double-sided pin which can connect two "holes" quite nicely. A gun is made from three additional pieces, and two heads are included-- one of which has a painted human face. What's more, the forums are lighting up that a post showed a new version (or new parts for) the Rig earlier this evening. (The Rig is a large, 4-piece hollow vinyl mechanical construct. It's quite nice.) The post in question has since been removed, so keep your eyes peeled for an update. User datadub on the October Toys forums has something you should see! 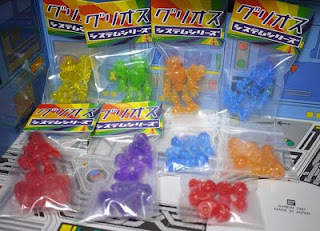 A number of presently unavailable Glyos figures in Japanese packaging are for sale, overstock from the Japanese toy store Fig-X.jp. Many of these are sold out after just a few hours on the forum, so take a look at the nifty packaging and order some while you can! 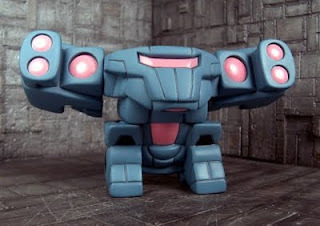 THEGODBEAST Customs-- and this dude makes neat stuff-- has announced orders are open for its Bio Jumpers accessories, which fit over the heads of Onell Design Glyos figures. Each set is $50 before shipping, and looks pretty sharp. If you like your toys fuzzier, Cast-A-Way Toys has flocked versions of these little bugs. No pricing has been announced yet, but hey-- you got choices! 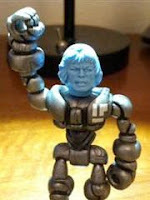 Cast-A-Way toys does a number of Mego upgrades and additions, they say this is their first foray into the Glyos realm. As you read this, Hasbro is currently shipping its Playskool Heroes line to stores. This line is similar to the Fisher-Price Imaginext toys, with articulated limbs and-- you guessed it-- vehicles. A number of vehicles are coming out in this line based on the Marvel, Transformers, and Star Wars licenses but not all are a perfect fit for Glyos. For example, the Freeco Bike and BARC Speeder Bike cannot easily accommodate your average Glyos-compatible figure without removing chunks of it-- the hands also cannot grip the controls on the vehicles. But the Landspeeder? It's just perfect. The line is part of the new reset going on at toy stores now, I've seen bits and pieces of it for sale online and at a few mass marketers. You can see more of it in my Toy Fair 2011 Coverage at 16bit.com.